“Milly” was our favorite kid in 2012. Standing out from the crowd from the day of birth, she has continued to excel, with great length of body, levelness over the top and rump, correct leg set, and a beautifully blended front end assembly. 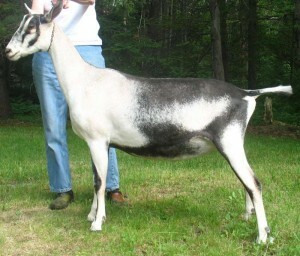 Shown twice as a kid, she was 1st in a large kid class at the Southern VT show in June, and 1X 2nd to Bathsheba. Shown just once as a dry yearling, Milly went Junior Champion and Best Junior doe in Show, earning her first GCH leg. 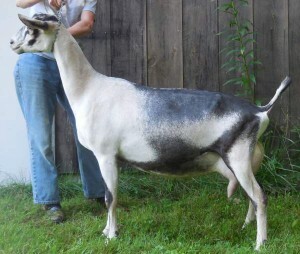 We were absolutely thrilled when she freshened with a mammary attachment to match her body! She has a high and wide rear attachment, a fore udder attachment blending smoothly into her abdomen, and perfectly plumb teats. On top of all this, we have been very pleased with her production as a furst freshener, peaking at 12 lbs. In the one show we attended in 2014, Milly placed 1st in her class. 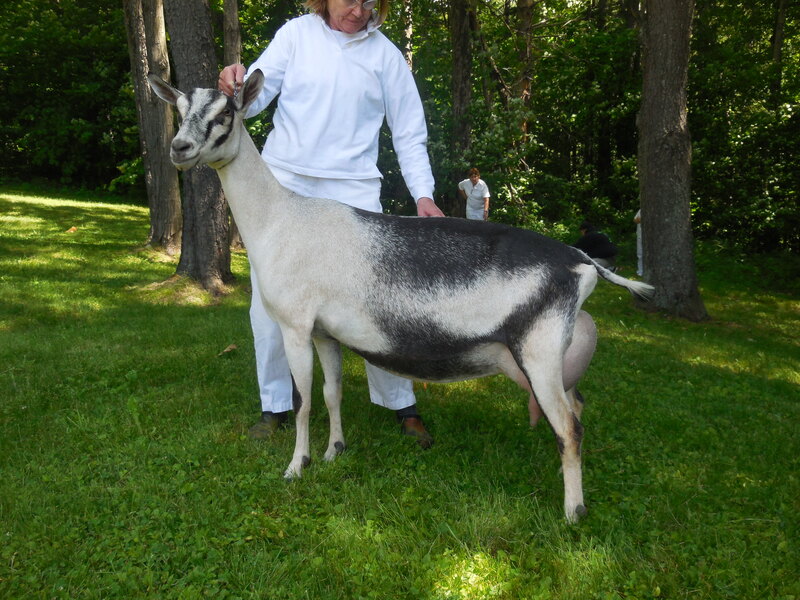 Shown twice in 2015, she went on to finish her Championship, with two GCH and Best of Breed wins. We view Milly as a valuable addition to the herd, and among the top does we have bred. We have retained two of her daughters from Nick, Amalie in 2015 and Milana in 2016. Milly had a very traumatic kidding in 2018 with a single 13 lb. buck, who we lost. She had a long and difficult recovery, but is doing well now.